Home > View All Products > Mallo Cups - 24 ct.
Mallo Cups - 24 ct.
Mallo Cups are the delicious combination of rich milk chocolate and a creamy mallo center that is sure to satisfy even the biggest sweet tooth. This American made candy is favored among candy lovers around the world, and was the very first cup candy made in the US. When you’re looking for candy that is delicious, classic, and original, choose Mallo Cups. I've been eating these things for the last 60 years and they are STILL as outstanding as they were 60 years ago. I saw a story on Food Factory USA about Boyer's candies. The job I want there is the one the final inspection lady has. As these delicious morsels of heaven pass by she pulls any rejects she sees off of the line. I don't know what she does, but I would pop each one into my mouth. Keep on making this manna from heaven, Boyers, and keep me in mind for that job if that lady ever leaves. I have been looking for this candy for years. I remember my Grandfather getting these for me growing up, but never finding them at any stores. 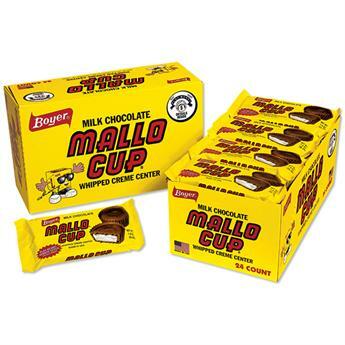 Personally I thinks Mallo Cups are the greatest candy ever!!! Mallo Cups are just as I remember. One of my favorites as a kid in Western PA. They taste every bit as good today and THEY ARE STILL MADE IN THE USA!